It’s hard doing cognitive things with literature without coming across as either defensive (yes, you really can use science without betraying the essence of the literary) or aggressive (why the hell aren’t you guys getting in on the act too? don’t you know how exciting it is?). Terence Cave’s new book is a modest masterclass in how to avoid both. But the book is excellent, and important. It is important, for everything that it expresses, and also because Terence, having built a career on other ways of studying literature, has in the last six years or so become convinced of the value of an explicitly cognitive approach. All those of us who move away from the traditional centres of disciplinary inquiry take different routes towards the borderlands. The prompts and consequences of Terence’s conviction are quite different from mine – I have a much more existential leaning towards empirical testability, for example. But anyone who wants to understand literature better can learn from Terence’s path. His interest is, far more squarely than mine, in the literary texts themselves – not the reading experience, not how minds work (though these bathe in the light he casts on the texts). Whether conceiving of literature as an instrument, a vehicle, an object, a product, a symptom, an archive, or a playground of thought (pp. 12, 14, 105), whether navigating nimbly through Yeats’s ‘The Balloon of the Mind’ or Winnie-the-Pooh, whether wading into the waters of cognitive representation or the sensorimotor constraints of ‘a soft grey cat-fog drifting in on foggy feet’ (pp. 101-102), words on pages stand at the centre. This decisiveness of focus doesn’t, as I say, shut out the workings of the readerly mind from illumination, and it certainly doesn’t proceed down the familiar dead end of trying to separate off literary language categorically from other language use (quite the contrary – as on pp. 71-72, 104), but it does mean that the science is shaped to the demands of the texts. This actually results in some nicely nonchalant examples of science-humanities give-and-take, most saliently in the discussion of cognitive affordances: Terence confidently adapts the psychologist James J. Gibson’s definition of affordance to encompass the object as well as what it affords (p. 48) – so Edward Lear’s old man’s beard is an affordance for birds’ nest-building, say (p. 6). Terence defends the philosophical ‘weakness’ of the concept as offering a bridge between the big picture of human evolution and the small brush strokes of textual construction. 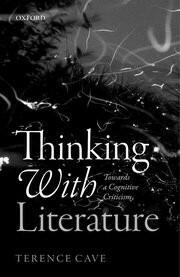 At moments like this, I felt particularly strongly that one of Terence’s main aims for the book – to promote the role of literary studies in the cognitive conversation – was being brilliantly furthered, and again, quite without any of the clarion-calling to arms which many of us feel necessary: just by doing some cognitive inflecting of literary study, and some literary inflecting of the study of the mind, and seeing where both end up. This can, as Terence admits, result in an unsystematic form of borrowing that ‘risks becoming a kind of pirate raid in which one grabs some interesting-sounding ideas and carries them off for consumption on home territory’ (p. 17). Interestingly, the psychologist who spoke at the launch event, Ilona Roth, had no problem with the pirate model. Although she stressed the importance of testability, the other two principles she spoke of in relation to what the book does were selectivity and adaptation: both are OK, indeed good. And Ilona’s prime example of adaptation was what Terence does with affordances. The other scientific commentator, Deirdre Wilson, a linguist who co-developed the theory of communication known as Relevance Theory, took friendly issue with Terence’s relegation of relevance theory to the unenlightened pre-embodiment era (p. 28). Deirdre insisted on the breadth of ‘inference’, as the central process by which we create meaning from what we read or hear; it is, she said, any procedure to yield a warranted conclusion, and anyone who equates it narrowly with logic, reasoning, or similar has misunderstood the theory. But I think what they both agree on is that misunderstandings shade easily into differences of emphasis and application, and that all are differences from which we learn. The launch event’s third commentator, the writer of fiction and non-fiction Marina Warner, remarked first off that this volume, while compact, is not small in what it makes you think. Or in how it makes you think – with a whole new toolkit for grasping literature with both hands: for coming to realise what kinesic affordances are, and then experiencing them in your own reading, guided by Terence’s readings. If language, as Marina put it, can be like a prosthesis, enabling new or forgotten kinds of cognitively literal movement, Terence’s book lets us try on a whole range of delicately calibrated limbs: calling our attention to our automatic responses, slowing them down, making them remarkable again. So we’re invited to read the opening line of Conrad’s Lord Jim, in which Jim is described as reminiscent of a charging bull. ‘Well, think of a charging bull. When you register visually the animal’s posture and the direction of its charge, how soon do you make it hot-foot for the nearest bull-proof exit? Pretty soon. […] Reflective cognitive response emerges visibly in this sentence (and the novel) from an instinctive, unreflective mode of apprehension’ (p. 23). And, in a slightly different kinesic mode, there’s the moment-by-moment unpacking of an aristocrat’s elegant vaulting of a chair in de Lafayette’s Princesse de Clèves: ‘Nemours’s options for coming through to the dancing area without delay are extremely limited. The milling crowd is solidified, reified, as a compact mass: the seat affords the slender opportunity of a clear path. […] We know that she knows that Nemours is an alpha male. […] We understand that she’s turned on, as we would say, by Nemours’s trick with the chair’ (pp. 117-118). Terence says early on that because there are many good readers who aren’t academics, ‘academic critics have to argue that their explanatory frameworks, theories, and formal protocols, their poetics and their rhetorics, add value to the individual experience of reading’ (p. 21). When I first read this, I disagreed on both the necessity and the possibility: studying literature, or literary reading, is about better understanding literature or reading, not enjoying it more. But by the time I got to the end of this persuasive work of criticism, at least half of my disagreement was gone.